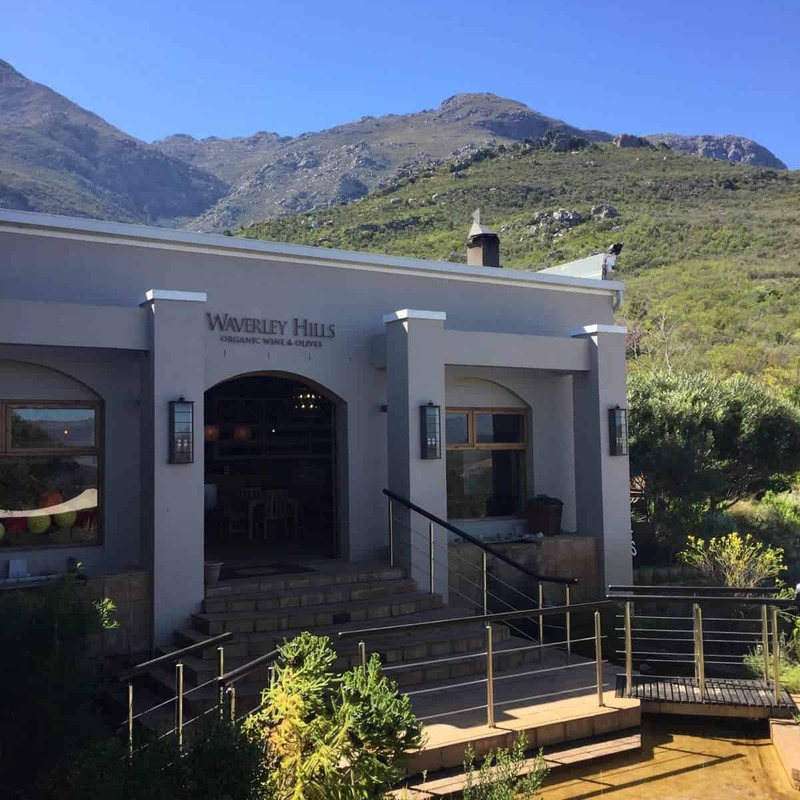 My husband and I were invited to Waverley Hills Restaurant in Wolseley for lunch – just over 90 minutes from Cape Town. 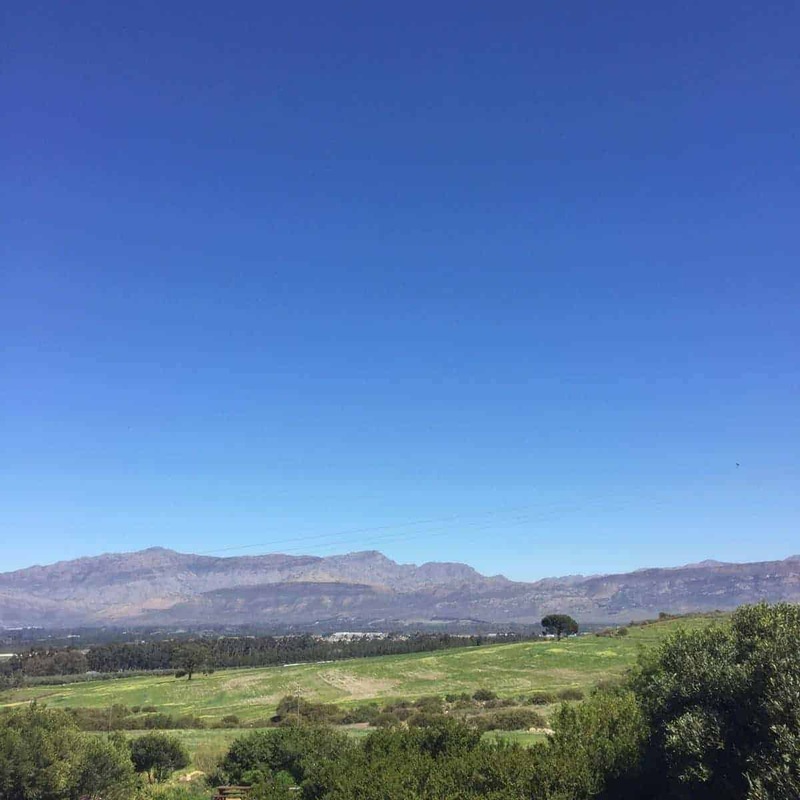 We decided to make a weekend of it and stay nearby in Tulbagh, stopping in Riebeek Kasteel en route, which all made for a really amazing weekend away! Driving up to Waverley Hills was really beautiful, especially this time of year where Spring has just started and all the wild flowers and blossoms are in bloom. We drove up the long driveway to find Waverley Hills nestled in the most picturesque setting – surrounded by mountains with a breathtaking view! We were welcomed by friendly staff and seated inside the restaurant – very clean and simple décor; with the tables nicely spaced, offering enough privacy but still feeling part of the vibe. It was a very relaxed and slow lunch so good for those lazy afternoons in beautiful surroundings while winding down with some great wine food. Chef Francois du Toit came to introduce himself and gave us some of the produce from their Green Fair market the previous day – he was an extremely friendly and down to earth guy – really great to have met him! The menu has a variety of dishes at a fair price range. There’s also a suggested wine pairing with the main dishes. All dishes were beautifully presented and flavourful. 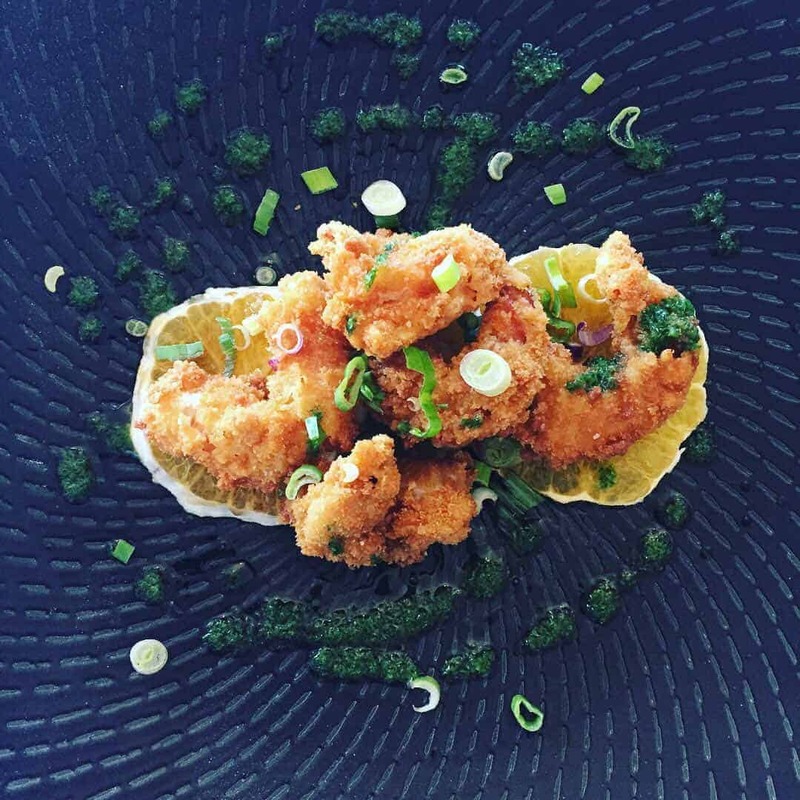 We Tried three different starters – the crumbed prawns with orange and ponzu dressing. This was my favourite starter! It was a great sized portion; the fresh slices of citrus and ponzu dressing complimented the prawns greatly. Very fresh and well cooked, and top points for presentation! 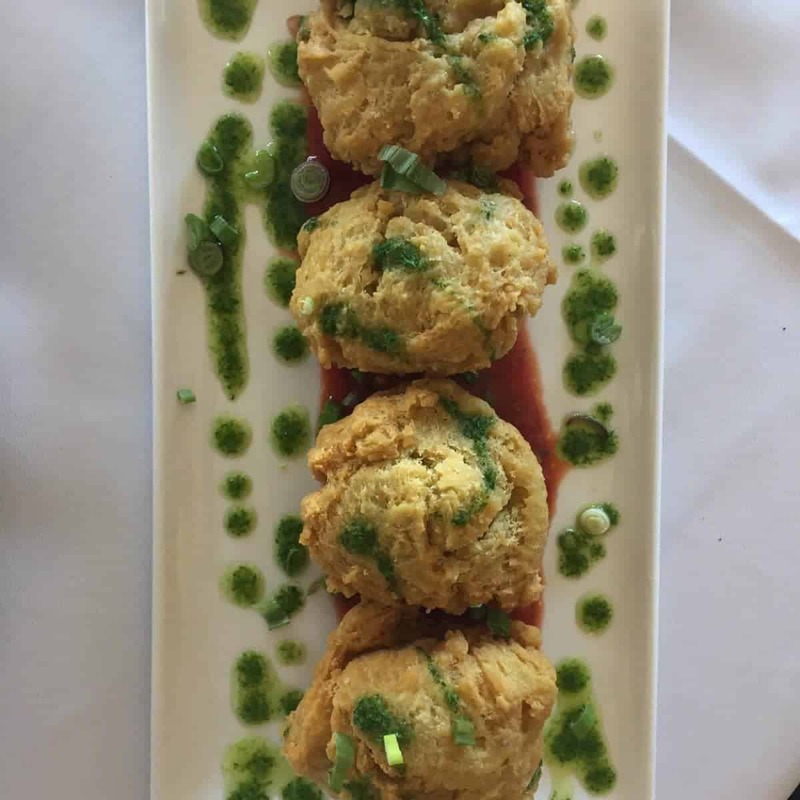 We also tried the chickpea and basil puffs with wild garlic and red pepper paste – this was a very generous portion, and the texture was great – I couldn’t stop eating them! The red pepper paste was a lovely addition but perhaps there needed to be a bit more sauce to dip them into. 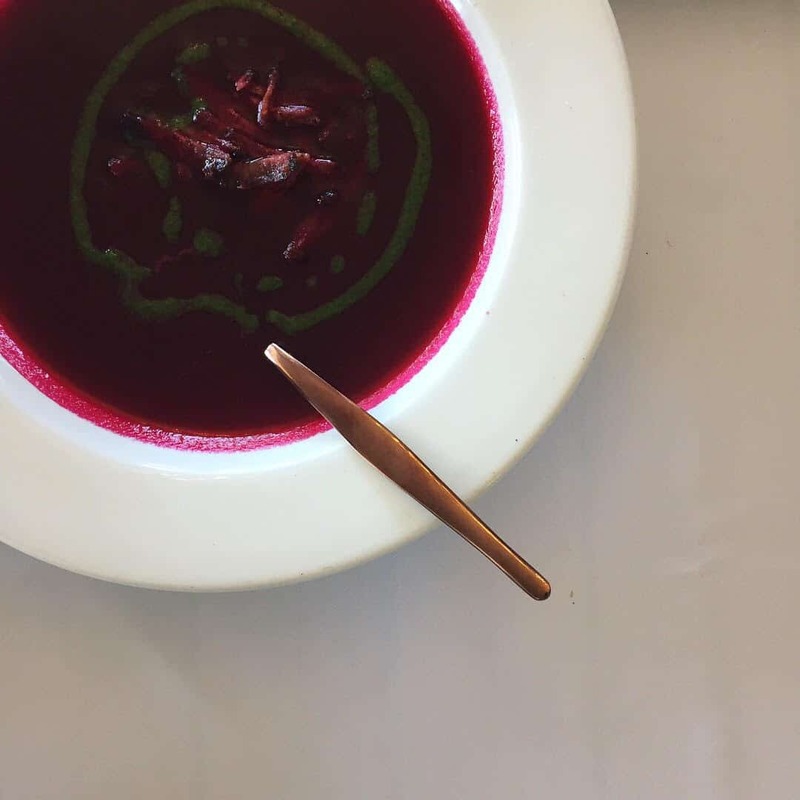 We also had to try the beetroot and pomegranate soup – this was an unusual taste with the texture of the crispy salami that was served with the smooth, sweet & creamy soup. Beetroot and pomegranate can often have a very ‘earthy’ taste but this dish was rather subtle in that regard, although it was very flavourful and the colour made it! There was so much to choose from – a lot of red meat dishes as well as a whole pizza menu (with some very interesting topping combinations – I would definitely like to go back to try some of these!). 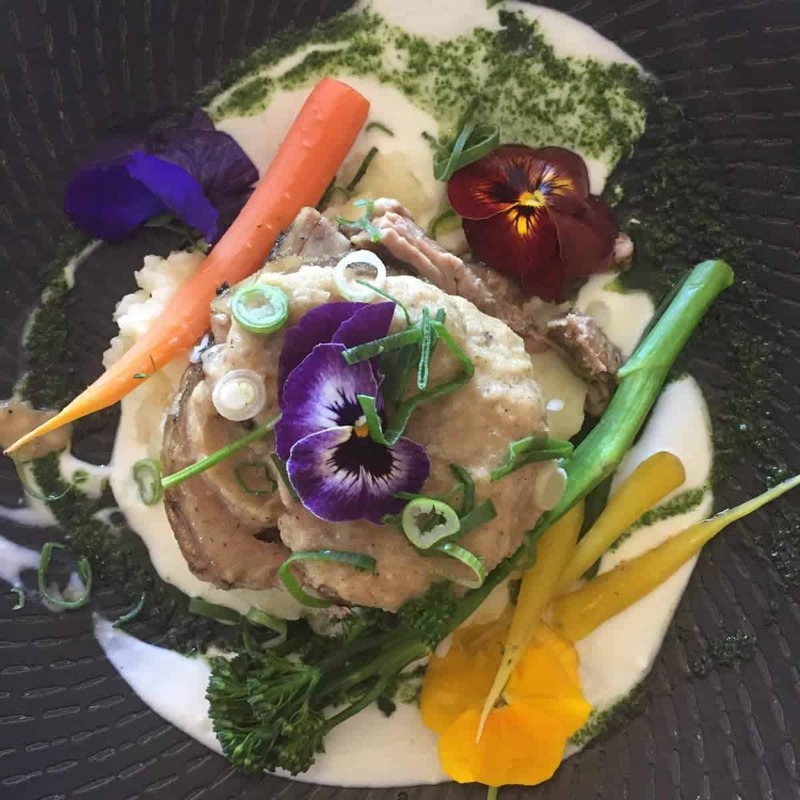 My husband had the slow cooked herbed lamb shoulder served with smoked yoghurt, roast onion foam, potato mash and veg. He said the lamb was very well cooked and soft, with perfect mash and the crunchy veg definitely added to the dish. The portion size was very fair too. He had this with the suggested Shiraz Mourvedre Viognier which was amazing! Not as spicy as most typical Shiraz’ but well balanced, very smooth and paired nicely with the lamb dish. I opted for the Asian prawn curry served with oriental rice pilaf and coriander salsa. I was very pleasantly surprised by how much flavour it had without being rich and creamy like most prawn curry’s I have tried. It had a bit of a bite but it wasn’t that spicy – just very delicious! The portion size was great for me having had starters or if it was for a lighter lunch it would be fine. I had a glass of their Cabernet (no added sulphates) – this had a rich red-fruit nose and quite a full-bodied flovour without being heavy – nice for an every-day wine in my opinion. 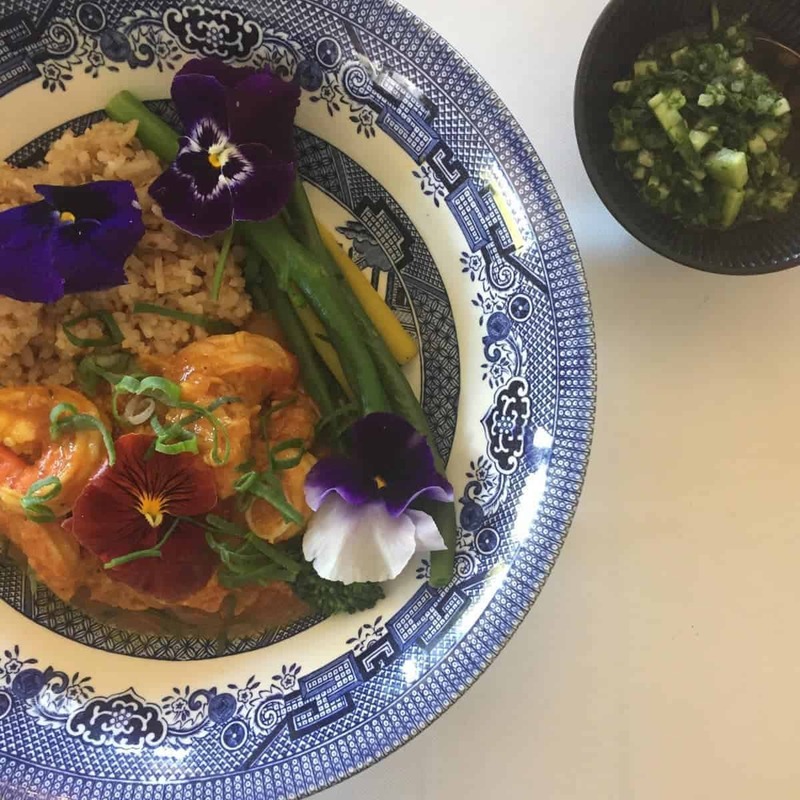 Both the main dishes were very colourful in their presentation with edible flowers and overall very pleasing to the eye as well as to the stomach! We were both pretty full by this stage and so we chose to share their tiramisu cheesecake. Perhaps I should have rather opted for their Pampoen Koekies served with a Butterscotch Sauce… This was part of the starters section so I actually had forgotten about it, but I will certainly be back to try them! P.S. I highly recommend taking the Baineskloof mountain pass road home to Cape Town – the perfect way to end the weekend!